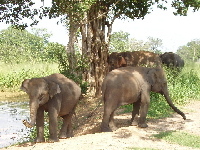 In December 2005 we visited Uda Walawe National Park in Sri Lanka for two days. 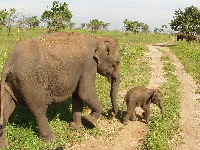 We booked this with Eco Team Sri Lanka after seeing their description of 4WD Safari Tours in Uda Walawe. They have a camp within the park. They organised a taxi from Colombo to the park entrance. 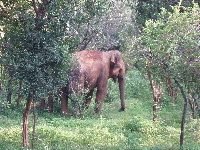 Here we transferred to a 4WD and met our guide - who was the chief naturalist of the company, Nayana Wickramasinghe. Our trip from here to the camp was our first game drive. In the camp we met the rest of the staff who had set up camp and now served us lunch by the Walawe river. After lunch we got organised in the tent (which had camp beds) and investigated the facilities - a flush toilet and a shower. Then out for another game drive. 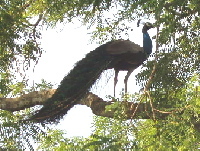 We saw a great variety of animals and birds, some photos are below. We had our guide, and our National Park tracker, and our taxi driver, and the 4WD driver, all spotting game for the two of us. Back to the camp as it was getting dark for supper and a good night's sleep. After breakfast, our next game drive took us eventually to the park entrance again. All the game drives were excellent, and we would be happy to recommend this tour to anyone. Below are links to some of my photos. 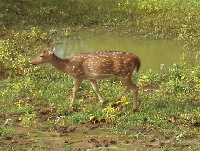 I used an Olympus Camedia Zoom C60.